These are anxious times. We just can’t seem to stop worrying – about our family, our finances, world events and a dizzying array of perceived threats to our wellbeing. We try to suppress the discomfort and uncertainty, but remain restless, on edge and unable to relax. Buddhist teachings offer practical, effective methods to help us let go of this anxiety. Gen-la Khyenrab will explore how we can cultivate mindfulness, focusing on special ways of thinking and skilful meditation practices that can lift away our disquiet and help us to face daily pressures and problems without fear. 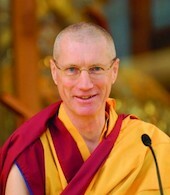 Gen-la Kelsang Khyenrab, international meditation teacher and National Spiritual Director for Canada, is a modern Buddhist monk dedicated to helping people everywhere find authentic happiness through the development of inner peace,compassion and wisdom. Wherever he goes in the world, Gen-la is respected for his powerful teachings based on the lived experience of integrating Buddha’s teachings into a full and demanding life.